Flat commercial roofs (a.k.a. low slope roofs) are the standard for most commercial buildings for a variety of reasons. Given the square footage of most commercial buildings, the peak on a sloped roof would be ridiculously high, not to mention the fact that there would be no place to put the building’s mechanical systems, such as air conditioning compressors. In other words, a flat roof simply makes more sense for a large commercial building. That said, commercial roofs are not without problems, and any building owner or facilities manager will attest to that fact. Leaks and moisture problems occur for different reasons on different types of flat roofs. For example, on a built-up roof (BUR), leaks might develop due to flashing details that were improperly fastened during installation. Hot bituminous and torch-applied modified bitumen roofs can leak if workers fail to install a proper moisture barrier underneath a coping cap or parapet walls. 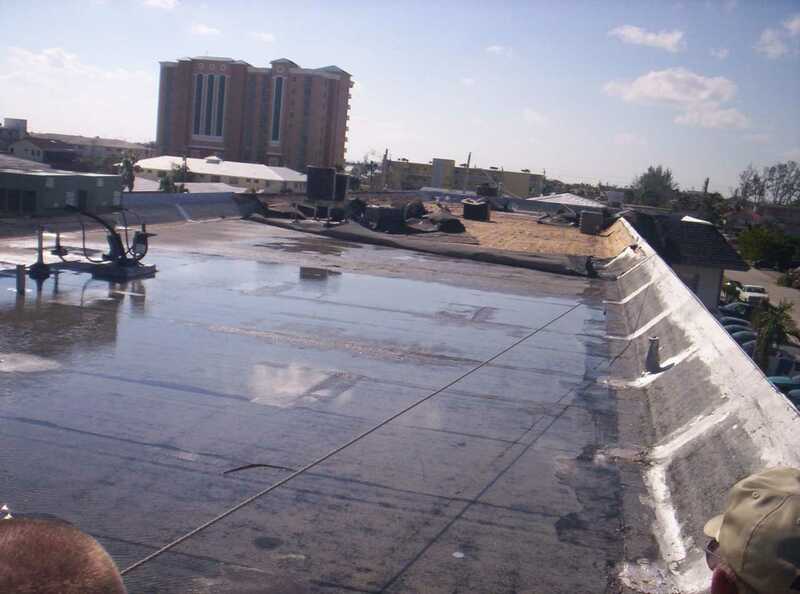 It’s impossible to overestimate the benefits of proper installation, since a poor installation job not only ensures any number of problems, but also dramatically reduces the life expectancy of a commercial flat roof. In the cases of nearly any type of flat roof, the devil is in the details. For instance, improper adhesion on a BUR system roof can result if the area isn’t cleaned, dried and properly primed before installation. Similarly, the performance of a torch-applied modified bitumen roof can be compromised if the crews fail to relax the sheets before installing them. Problems such as blisters, leaks and wrinkles can also arise if the ambient temperature is not right at the time of installation. Whether it’s a lack of knowledge about roofing, or simply a matter of skewed priorities, failing to regularly inspect and fix minor problems can and does lead to bigger problems, including premature failure of a flat roof. This is a common problem across all classes of flat roofs, and can be due to improper slope, clogged drains or HVAC units without condensate drain lines. Before any repairs are made, it’s essential to determine the cause of ponding water. If inadequate slope is the culprit, there are products designed to correct the problem. One of the best is RoofSlope, a revolutionary product that provides auxiliary sloping for commercial cap-sheet roof installations and rehabilitation. This is a common problem with all flat roofs. Damage from foot traffic can cause scrapes or cuts in the membrane and damage to the underlying substrate. Beside the risk of causing leaks, damage to the membrane caused by tradespeople can also void the warranty. One way to combat the problem is to create walkway paths or lay “sacrificial” layers of membrane to proactively avoid the problem. Besides foot traffic, the addition of new equipment and penetrations can also cause problems. Using materials that were never intended for use on a specific type of flat roof is one of the most common causes of damage to flat roofs. This happens frequently on metal roofs where people try to make repairs with things like caulking and plastic roof cement. The same problem occurs when repairs on a single ply membrane are attempted using plastic roof cement. Splitting, blistering, ridging and surface erosion are commonly seen problems on BUR roofs, and may eventually lead to bigger problems. Blistering and other surface flaws occur on different roofing materials for different reasons. If they’re minor, they’re not always worth fixing, but large blisters should be addressed. The key to ensuring the longest possible life for your flat roof is quality installation, regular maintenance, and addressing the need for repairs as quickly as possible. Contact us today to learn more about how RoofSlope can solve your commercial flat roof’s ponding issues.